Sicho Dorje couldn’t be more familiar with the taste of air-dried yak meat. For generations, Tibetan herders without refrigerators had yak meat air-dried in winter, sometimes stored it in sheds made of cow dung, and ate it with Tsampa, the roasted barley flour, and buttered tea all year round. Growing up eating air-dried yak meat in northern Tibet, the 29-year-old is now doing what he calls “a pioneering job”: providing customers with the freshest yak meat possible. “It takes 72 hours to deliver our yak meat to Beijing and 40 hours to Chengdu. In Zhejiang, our minced beef balls sell quite well,” said Sicho Dorje, who leads the company’s marketing department. Marrow bones which used to be smashed for soup braising in herders’ kitchens have now appeared in the fast-frozen food counters of supermarkets, neatly sliced and packaged to retain freshness. “The old-generation of herders lacked market awareness and seldom thought about how to tap the market. Since stock breeding is the most profitable industry on the Plateau, our job is to figure out how to be competitive,” he said. “We are confident about the market, as yak meat customers value freshness and nutrition,” he said. 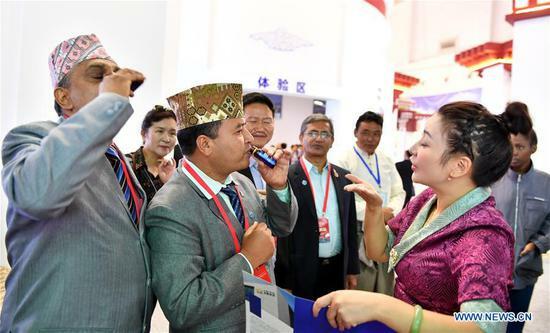 Embracing the market, fearing no competition and exploring a type of business to magnify their advantages have become the standard features of Tibet’s booming entrepreneurs, according to Li Guowei, who has been working in Tibet for nine years. The success of each entrepreneurship program often concerns many poverty-stricken households. Sicho Dorje’s fast-frozen yak meat business, for instance, has signed up 3,000 impoverished herders, while the Tibetan egg farm in Lhozhag County hires 51 local farmers. When the industrial revolution swept the world in the 19th century, Tibet’s economy under serfdom was static, and the region completely missed it, said Qizhala. Haunted by the question about why Tibet has the best wool in the world but couldn’t produce the world’s best rugs, Kesang Tashi established Khawachen many years ago and has been striving to make a difference. The Khawachen rugs fusing Tibet’s traditional designs rich in cultural significance with modern aesthetics have been sold to Japan, Britain, the United States, Germany, and Australia. In Kesang Tashi’s opinions, a good rug deserves the greetings from its users. “When you enter the room and see the rug, you should put your palms together and say ‘Tashi Delek,’ which will bring good vibes and brighten up your mind,” he said. “I am sure our yak meat tastes better than Kobe beef and Australian beef, as no other grasslands across the world can rival our Changtang plateau,” he said.